What mindfulness book should you read next? If you need something new for your reading list, I would like to share with you a few ideas. Learning more about mindfulness and applying that knowledge to your daily life is essential for your spiritual practice. That is why you always need to have a list of best mindfulness books that you can read whenever you have free time. The books I’m going to mention in this post are written by a renowned mindfulness teacher Thich Nhat Hanh. He is at the forefront of introducing mindfulness to the western world. His books are written in a simple language and teach you the main concepts of mindful living. In this beautiful and lucid guide, Zen master Thick That hath offers gentle anecdotes and practical exercises as a means of learning the skills of mindfulness — being awake and fully aware. From washing the dishes to answering the phone to peeling an orange, he reminds us that each moment holds within it an opportunity to work toward greater self-understanding and peacefulness. World-renowned Zen master, spiritual leader, and author Thich Nhat Hanh shows us how to make positive use of the very situations that usually pressure and antagonize us. For him, a ringing telephone call can be a signal to call us back to our true selves. Dirty dishes, red lights, and traffic jams are spiritual friends on the path to “mindfulness” — the process of keeping our consciousness alive to our present experience and reality. The most profound satisfaction, the deeper feelings of joy and completeness lie as close at hand as our next aware breath and the smile we can form right now. Transformation and healing presents one of the Budda’s most fundamental teachings and the foundation of all mindfulness practice. The Sutta of the Four Establishments of Mindfulness has been studied, practiced, and handed down with special care from generation to generation for 2,500 years. This sutra teaches us how to deal with anger and jealousy, to nurture the best qualities in our children, partners, and friends, and to greet death with compassion and equanimity. 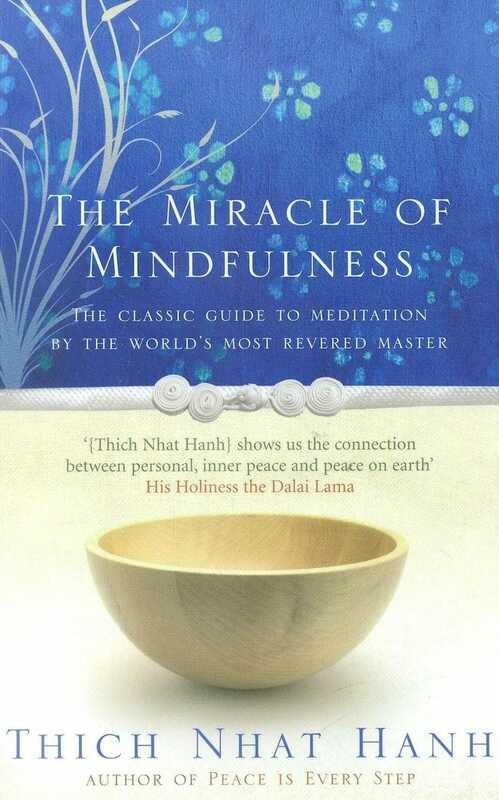 Thich Nhat Hanh’s commentary is organized into twenty exercises that guide readers through the fundamentals of Buddhist practice and offer insights into mindfulness in daily life. In May 1998, more than four hundred practitioners from around the world joined Thich Nhat Hanh’s first 21-day retreat in North America in Vermont to experience mindfulness. The Path of Emancipation, which transcribes this retreat, comprises an in-depth instruction in the “Sixteen Ways of Breathing” from the Discourse on the Full Awareness of Breathing. Applying the teachings to everyday life, Thich Nhat Hanh shows how it is possible to slow down and get in touch with our breathing. He teaches the practice of mindful breathing, walking, and sitting and how the practice of mindfulness releases suffering and leads to a wholesome and happy life. Bringing the energy of the true presence into our lives really does change things for the better — and all it takes is a little training. This treasury of 365 gems of daily wisdom from one of the most beloved Buddhist teachers of our age is a help and support for anyone who wants to train to meet every moment of life with 100 percent attention. Thich Nhat Hanh shows how practicing mindfulness can transform every area of our lives — and how its benefits radiate beyond us to affect other and the whole, larger world. Initially developed by Zen Master Thich Nhat Hanh as stretching breaks between long periods of sitting meditation, the Ten Mindful Movements have become a popular tool to reduce stress and tension. These simple and effective movements, based in yoga and Tai Chi, can increase mental, emotional, and physical well-being, and are suitable for people with a wide range of physical abilities. Each exercise is fully illustrated by Wietske Vriezen, a Dutch artist, and movement teacher. 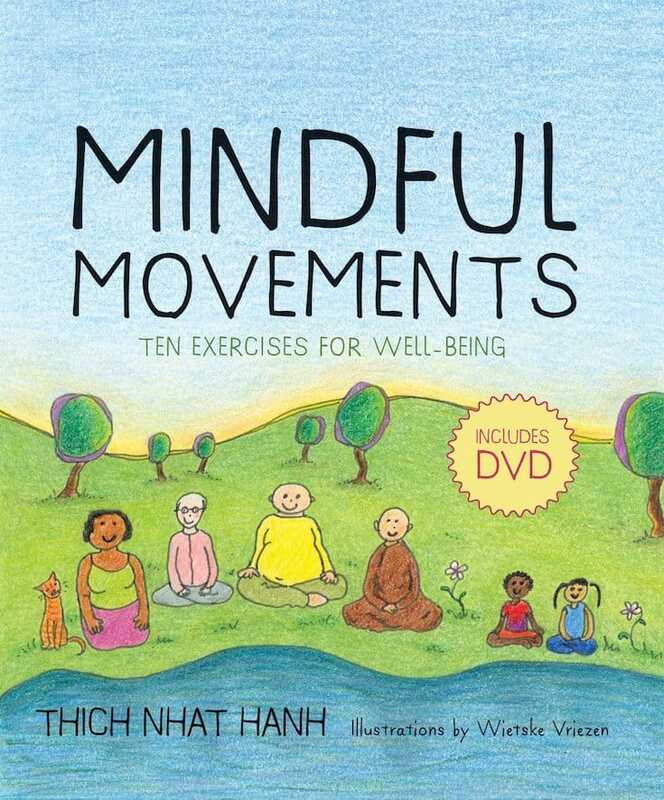 The book includes a 35-minute DVD of Thich Nhat Hanh and members of his Plum Village Sangha demonstrating the Mindful Movements. It’s not uncommon for some of us to be in a cycle of guilt and shame when it comes to food. As a result, we spend many hours worrying about what we ate or if we exercised enough. In this book, a famous Zen master Thich Nhat Hanh and nutritionist Dr. Lilian Cheung show us how to end weight loss struggles once and for all. This book offers practical tips, including a nutrition guide, mindful living plan, and goal setting. Authors help us find the roots of our unhealthy habits and transform our behavior. The book teaches us how to integrate mindful practices into eating, exercise and other aspects of our lives. 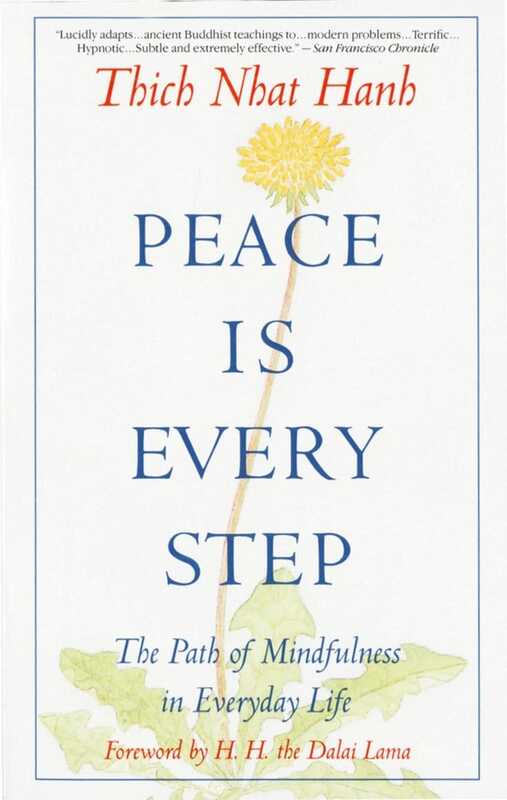 Based on a retreat that Thich Nhat Hanh led for Westerners, this book offers a range of simple, effective practices for cultivating mindfulness, including awareness of breathing and walking, deep listening, and skillful speech. You Are Here also offers guidance on healing emotional pain and manifesting real love and compassion in our relationships with others. Simple, warm, direct, and startlingly potent, this book reveals the heart of the Buddhist path and helps us to reconnect with the joy and wonder of being alive, regardless of life’s changing circumstances. Take a look at the selection above and choose one book for you reading list and then let me know your thoughts about it. Or let me know what other best mindfulness books should be included in this list.